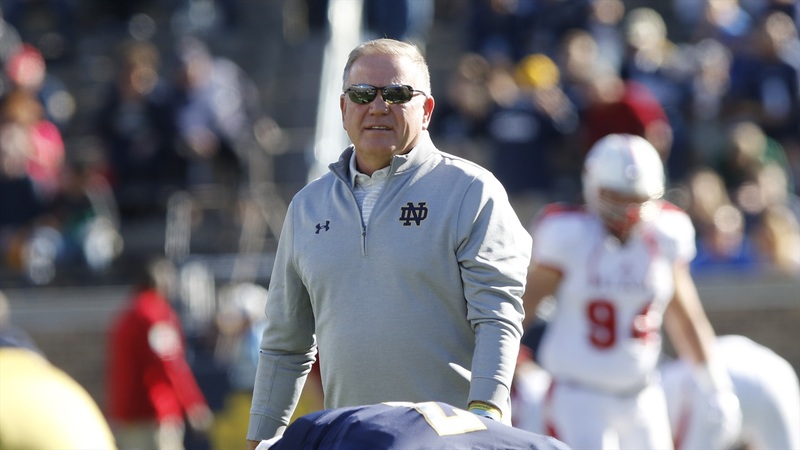 Notre Dame head coach Brian Kelly has won the 2018 Home Depot Coach of the Year Award and becomes the only coach to win it multiple times. Kelly also won the award in 2009 (Cincinnati) and 2012 (Notre Dame). The recognition is well deserved as Kelly has his Irish 12-0 and in the College Football Playoff for the first time as No. 3 Notre Dame will face No. 2 Clemson on December 29th. It was also probably a pretty easy decision to name Kelly for the award as he made a tough decision in week four to move to quarterback Ian Book. Kelly not only replaced his quarterback in 2018, but he also replaced his defensive coordinator and a legendary offensive line coach. On Thursday night, Kelly will be honored at The Home Depot College Football Awards, which will be shown on ESPN. Kelly is also a finalist for the Dodd Trophy and the Eddie Robinson Coach of the Year Award.